A few years ago I bought pair of vintage earrings from a car boot sale…. 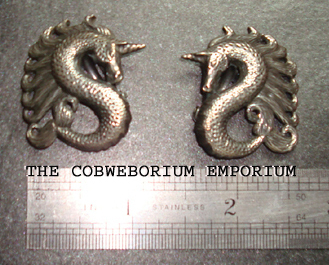 Vintage Unicorn Earrings which inspired the Enchanted Unicorn Focal Pendant. I can’t remember how much I paid for them but I have this feeling that it was something like £2.00 or £2.50. I wasn’t buying them to wear, I bought them because they’d charmed me and I’d fallen in love with them. I ‘needed’ to own them so that I could look at them – and for a while they sat on my dressing table where I could see them, and pick them up too, because they’re so amazingly tactile and they feel so lovely in the hand! A few weeks after I’d bought them I looked at them and had an idea that maybe I could make something a little inspired by them, perhaps a pendant, either on a beaded necklace or hung on a coloured rope type necklace. So I took them to my work desk and, using them as inspiration, I made a unicorn using polymer clay. All made from white polymer clay. The head, neck and ears were pretty easy to form, – a long(ish) sausage, thicker at one end and tapering off at the other– but I decided to make the neck a lot shorter than the necks of the unicorn earrings, and also the face a little plumper. I wanted to give my Unicorn a shorter nose too, as I wanted him/her to look a little more ‘comely’, sort of a bit more friendly and maybe a tad more magical. Once the head and neck were formed it was at this point that I had to decide where to put the ‘hole’ for the necklace part. I knew I wanted a hidden hole, so had to work out where the hole would have to be in order for the pendant to hang properly and where I could hide the hole with ‘hair’. I’ll admit at this point that pushing a knitting needle through the head of this incredible magical beast felt SO cruel. Ugh, … I felt like the RSPCA would be knocking on the door any minute and I’d be arrested for cruelty towards a *mythical* creature. Hole made, … Next came the Unicorn horn. 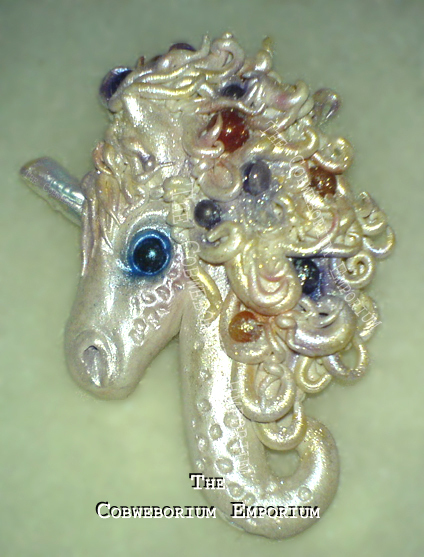 I chose a long, (rectangle shape) freshwater Biwa pearl for this, which I wrapped with a short wire twist, added a little liquid clay to it so it would anchor firmly and then slowly and carefully pushed the horn into the Unicorns head. I know when you look at the bigger photograph of the Unicorn, the eye kind of looks like it could be complicated. Don’t be fooled, it’s way easier than it looks. The eye itself is a round, polished gemstone which is set into an eye socket (a sort of ‘crater’) which I made by pushing a sculptor’s ball tool into the clay to make that eye socket. If your a crafter you might well have a ball tool which you use to press into the centre of a punched out flower in order to give it that realistic look. Providing that you’ll never use that tool on any food item, then you can use the tool on polymer clay. But if you’re possibly going to use any item for food making then you MUSN’T use it on polymer clay. After the socket was formed, I rolled a small, thin sausage of clay and wound it in a circle around the eye, cutting it at just the right point (I find an angle cut works better than a straight cut & it’s easier to ‘hide’ the join or seam) and then closed the seam between the two ends by carefully blending the ends of the clay together. I added a tiny bit of liquid clay into the socket and then took my bead and inserted a little ‘thread’ of wire through it, twisted it around the back and then gave it a little kink so that it would work as an anchor to hold the gem bead in the socket. I then carefully pushed the bead gem into the socket, making sure that the wire went through that tiny bit of liquid clay, so that the liquid would wrap itself around the clay and ‘set’ when the clay went into the oven. Now it was time to add the mane. As I made the curls of hair, I applied each one very carefully so that they built up in layers, hiding the hole I’d cruelly made through his/her head for the necklace . I also wanted to add a twist. 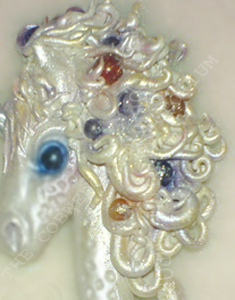 I wanted it to be more magical than just a mane, so added real gemstone beads, tucking and nestling them into the curls of hair, anchoring each one with a twist of wire threaded through the small holes drilled in the gemstones. The final thing I did was to add a little Pearl-Ex powders, in various places and various colours, so that the P.Ex picked up on the colours of the gem stones and gave a little ‘glow’ around them and accentuated the deep blue of the eye. He then went into the oven and, a little while later, a unicorn was born. – A Gem set Focal Pendant. If I were to make the unicorn again, I’d make the mane of thicker pieces of clay rather than those small curls. Although I love the individual smaller curls, I worry about them catching on something and being broken. Next Well this isn’t funny – not even one bit. Meandering through your blog I found this. I absolutely love it. You are so clever. I have (mostly) all day, every day, to craft to my hearts content and yet, since a week before Christmas, no crafting has taken place. Having a puppy who I dote upon, has taken every waking moment of my time. I’m either feeding him; playing with him; in the garden with him; removing things from his mouth that he shouldn’t have (boy oh boy! what a cavernous mouth he has for a puppy! ); cleaning up accidents he has (where he’s missed the puppy pad – front legs on but back legs not! ); or simply loving him. (When he’s tired, he likes to be rocked, like you would a baby). I did make some Christmas things around October last year – but didn’t do any blog posts about them, and can’t really do them now because, well, Christmas has been and gone, and so I’m now lacking in anything I can share. Crafting will begin taking place again soon, because there’s something I’m itching to make, but until I can do it and take photo’s, I thought perhaps I could ‘re-share’ something that you may not have seen, as I posted this 5 years ago, back in 2014, when my blog here was all shiny and new. It’s: The Enchanted Unicorn. As a new comer ( well sort of ) to the Cobweb studio I am so glad you reposted this. I know I should take the time to visit older post but goodness I’m doing good to keep up with everyday blogs. Your fingers work differently than mine. You do such beautiful ‘ little things’ that I just can’t pull off. I’ve never been much into Unicorns but love seahorse’s and they seem to be in the same family. You are without a doubt the most talented friend I have and I love you to bits. Give every one over there …Mr.Cobs,Hugo and Little Cob a big hug from across the big pond. Aw, I wouldn’t expect anyone to go back in history to see posts I’d made when dirt was invented, so don’t fret over it. I follow blogs that I haven’t had chance to go backwards in their blogs. Life gives us 24 hours each day. We spend a lot of them sleeping(because we HAVE to),and the remaining hours we have to do a whole gamut of other things which just eat up time. I got up at 4.30am this morning, then went back to bed after sorting this wee puppy out (he woke and just needed a cuddle, so we cuddled for ten minutes until he felt happy again), and was then up again at 6.30. The next time I checked the clock it was 12.40pm and I swear I’d only blinked ten times! The afternoon was taken up with having to shop, and then collect Little Cobs from school and feed him his evening meal before Daddy came home from work to collect him. Then it was time for our evening meal and … an hour later I’m ready for bed again! Time just slips away! So don’t you go beating yourself up for not managing to go back in time on any of the blogs you follow. We do what we can and hope that people understand that we’re doing the best we possibly can. Bless you for saying I’m your most talented friend, you say the loveliest things and make me feel so loved … but I ‘ditto’ what you said only I say it to you …. for you are probably my most talented friend. You make the most incredible cards, and each one is a true work of heart, and my only wish is that you blogged them! If wishes could come true, I would want you to share your talents with everyone, so that they could see what I see. And now I’ve mentioned this great talent of yours … I’ve had a bit of a read about Etsy, and a chat with someone in the know. I’m thinking that this is the place for you, my wonderful friend. You might sell only one or two at first, because you’ll need to be on Etsy for a short time to ‘make a name’ for yourself. Once people can see that your cards are amazing, and that you’re the trustworthy gal we all know you are, and that you have some great feedback from people who have bought from you … I think you’ll make some decent money for yourself and get back money you’ve spent on your makes. Seriously Bev. Have a think about it. I think it’s the place for you. I shall give the hugs out, as requested, and I know they’ll be received in the love you sent them in. Just wondering. I should have taken a picture,,I know , ECD had a contest so to speak using a new die . Crazy me was so busy trying to get it in the mail befor the rush. Ps. I did take pictures of something I sent Rabbit after her terrible heart break. It was multimedi, sort of like something you would do. But alas , I’m still in the try stage. She should have gotten it this week . but you never know.I’llsend you pictures for critic. Ohhh I’m forever forgetting to take photographs of things Beverly, so you aren’t on your own there. I give presents/gifts/handmade cards and (normally) the following day I suddenly realise that: “Oh Nooo. I’ve done it again!” and by that time it’s too late. Thank you Beverly, for your wonderful kindness. I shall still email you, though as I have stuff to share. Thank you. I was just so sure the post had misplaced ..Did it come in one piece. I need to know before I try to sell on Etsy or where ever. Those clear boxes are supposed to go but you never know what kind of treatment they will get. Yes, everything was fine and groovy. A) it’s really light in weight and adds virtually nothing to the weight of the card. B) It can withstand knocks and a bit of pushing and weight on top of it, from other packages or letters being piled on it. I pack the boxed (card box) inside some polystyrene which I hold in place with either a bit of sellotape wrapped around it, or to elastic bands – going in different directions – which holds it all in place. I then just use some brown, parcel wrapping paper – as if I’m wrapping a gift – and then pop the address of sender and address of the person the package is going to. Up till now this has worked for me and cards have always arrived unharmed. But … your boxes, if they can withstand the sending overseas, and all the knocks and bumps they get from that, should work brilliantly for cards being sent inside the US. I’ve just sent you an email, but thought I should have replied here …. You said you forgot to take photographs of the card(s) you sent to me, so … would you like me to take photographs of the card(s) and email them to you, so that you can post them on your blog? Just say so if you want me to do this. The card(s) are wonderful – but the card in the box is MAGNIFICENT, INCREDIBLE, AMAZING! – and is one that I really think you should share on your blog. It’s perfection and has such great quality about it. It’s just too precious to allow any dust anywhere near it. I love it that much! Just let me know if you’d like me to take photos of it (or of them both) and it shall be so. And it’s my Craft Room Fairies who craft the fairy sized paint brushes. But … your imagination is working well, Grasshopper. Thank you both for your lovely comment, and for visiting. Bless your heart.